Dr. Kondapalli is a specialist in the medical treatment of retinal diseases with additional training in treatment of ocular tumors and cancers. A Cleveland, Ohio native, he graduated from The Ohio State University and received his medical degree from The Ohio State University College of Medicine. 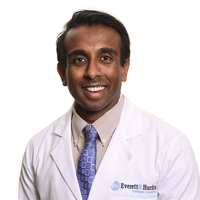 Having an interest in ophthalmology at a young age, Dr. Kondapalli has presented at national and international meetings since 2006.Dr. Kondapalli completed his ophthalmology residency at Loyola University Medical Center in Chicago, Illinois. He then returned to Ohio to complete a fellowship in medical retina and ocular oncology in through The Havener Eye Institute at The Ohio State University Wexford Medical Center. He has extensive experience in treatment of macular degeneration, retinal vein occlusions, and diabetic retinopathy. He was actively involved in clinical trials and is up to date on the most current treatment modalities.